DEARBORN, Mich., (Feb. 6, 2018) — Bob Tasca III, driver of the NHRA Motorcraft Ford Mustang Funny Car, discusses last week’s NHRA Spring Nitro Test Session in Arizona and the upcoming NHRA Luca Oil Winternationals at Auto Club Raceway. 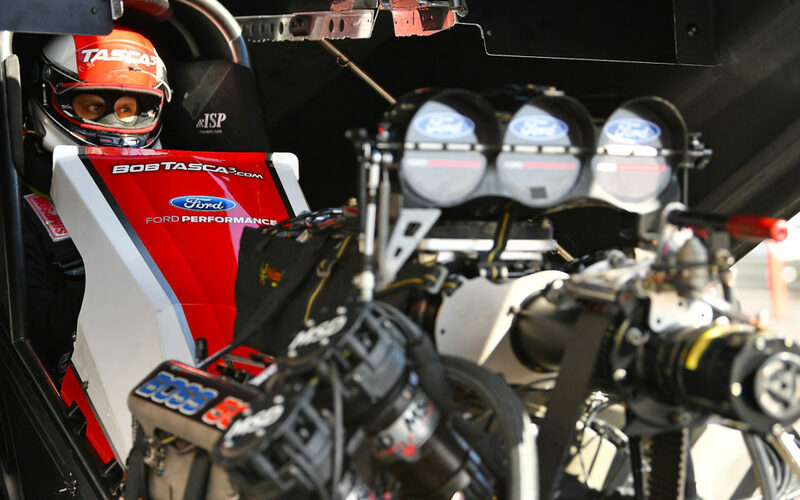 Tasca returns full-time to the Series with sponsorship from the Ford Customer Service Division (FCSD) brands Motorcraft, Omnicraft and Quick Lane. HOW DID THE TEST SESSION IN ARIZONA GO FOR YOU AND THE TEAM? “It was the fastest and quickest car that I’ve ever driven in my career. We made multiple runs, incremental times, not full passes because we were working on a fuel system. Nearly every time I hit the throttle it was the quickest and fastest runs that I’ve ever been on. We did make one full pass in the heat of the day on Saturday. We a 3.96 (seconds) at 322 miles per hours, which I believe was third fastest of the session. “Like anything else, a lot of new parts. A lot of new guys. We had one unfortunate incident. On the second run of the test session we broke an intake valve and it was the biggest explosion of my career. It was violent. It leveled the engine. It destroyed a brand new Motorcraft body. So, we’re working hard to get another body ready for Phoenix. We have a third body ready for Pomona this weekend that we’ll have for a spare. But we want a newly designed mounted body for Phoenix. It’s racing. Nitro Funny Cars are very unpredictable. All-in-all, we were very pleased. We had good short times. Very good incremental numbers. We’re ready for Pomona. YOU TALKED ABOUT HAVING GOOD EARLY NUMBERS. DID YOU GET ENOUGH DATA TO UNDERSTAND THE FIRST 300 FEET OF A RUN? “The hardest thing to get right is your early numbers; starting line to 330 feet. We ran the quickest low-numbers of my career. We were capable of running 3.80’s…3.85 to 3.88 bracket. So, we got that down fast. The runs wewanted to make full pulls at… the last run on Saturday night…we were trying to put an enormous number up. We have a new fuel system on the car and we had about a gallon-and-a-half more at the hit (of the throttle) and it dropped a cylinder. The plan shutoffs, if we had taken it to the lights, the Mustang was going to run fantastic. The other thing in testing is that you don’t want to throw all your parts away, either. It’s a strategy as how you approach it. We accomplished everything we wanted to except for that last run on Saturday. TALK ABOUT THE CALLENGES HEADING INTO THE FIRST RACE OF THE SEASON? ARE EARLY SUCCESS RUNNING BIG NUMBERS? RUNNING 1000 FEET? HOW DID THE TEAM WORK IN THE FAST-PACED ATMOSPHERE OF A SUNDAY?